Sebastian ended the night sad and Johann happy as the two finished their night by watching the European Team Championships in soccer. Powerhouse Munich was playing against Sebi’s team and it didn’t go that well for my dear friend’s soccer club. 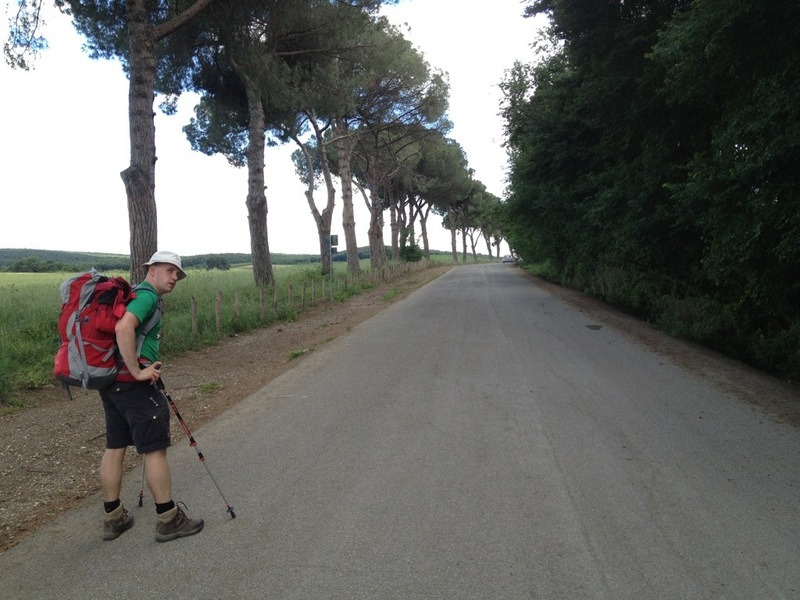 By the morning Sebastian was over it, and after breakfast and a ride back to Ponticelli we were back on the trail. Over dinner we, the original four, had decided to push on to Monterotondo today. This would mean a 28 km (17.5 mile) walk, but it would also get us into Rome a full day earlier than our original itinerary. Unfortunately it would also mean we would say “goodbye” to Johann, since he both was weary from yesterday’s walk and already had a reservation for Montelibretti, just 15 km ahead. At 9:00, as we began, Johann came to understand what a determined group we can be when we have a challenging goal ahead. 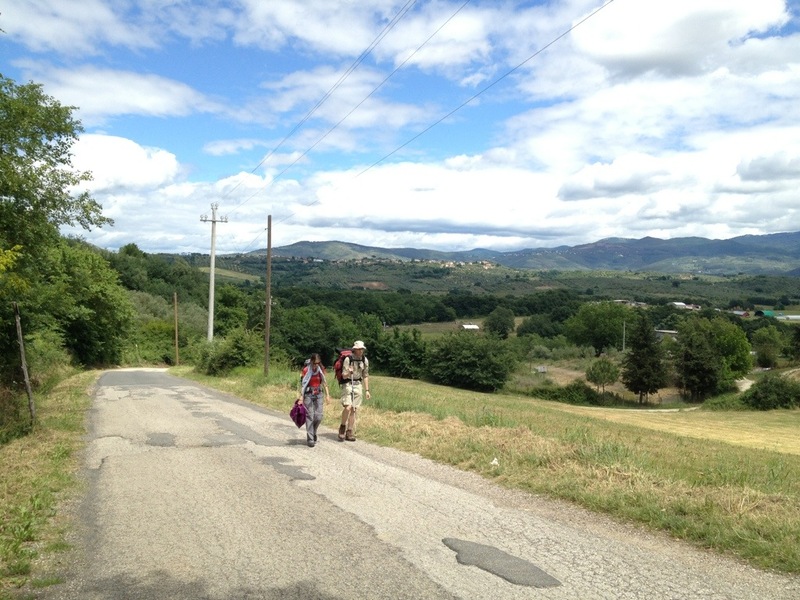 At Ponticelli we set a brisk pace up and down the requisite Italian hills, and by 11:00 we were already at the halfway point for Johann — the little town of Acquaviva. He wanted to stop there for a break so he wouldn’t grt into Montelibretti too early, but for us it was just too soon in the long day to pause. We exchanged phone numbers and said our goodbyes, with promises to get together in Rome in a few days. I think we all felt sad to let our new friend go, but it was easier knowing we’d see him in just a bit. We set out for Montelibretti and, to our surprise, arrived at the base of the Montelibretti hill at about noon. By 12:15 we were in the main piazza of he town, enjoying the cheese, crackers, apples and bananas Sebastian and Andreas had purchased yesterday. We’d realized that most every Italian store would be closed today — Sunday — so the two loaded up on groceries for us in preparation for today’s lunch. As we sat and enjoyed our simple meal I noticed another hill town off on the horizon and asked a dignified looking Italian gentleman if it was Monterotondo. “Yes,” he said, and then gave me driving directions for how to get there. I told him, in Spanish, that we were walking there today and his eyes widened in surprise. “It’s 15 kilometers,” he said. “Yep,” I replied in my best Span-talian, “we’re pilgrims to Rome.” Impressed, he tipped his hat and wished us a good trip. Since we hadn’t done our push-ups, we did our three sets of 20 in the sunny piazza. Afterwards we headed down the nearby road which we followed out of town. The sun came out and a long afternoon of walking followed. By 3:00 we were all beginning to drag somewhat, so since we were on a quiet road between farms we simply laid out a picnic spread in a shady spot under an old oak tree and enjoyed the leftover cheese, crackers and fruit. A half hour later we were back on the road to Monterotondo. 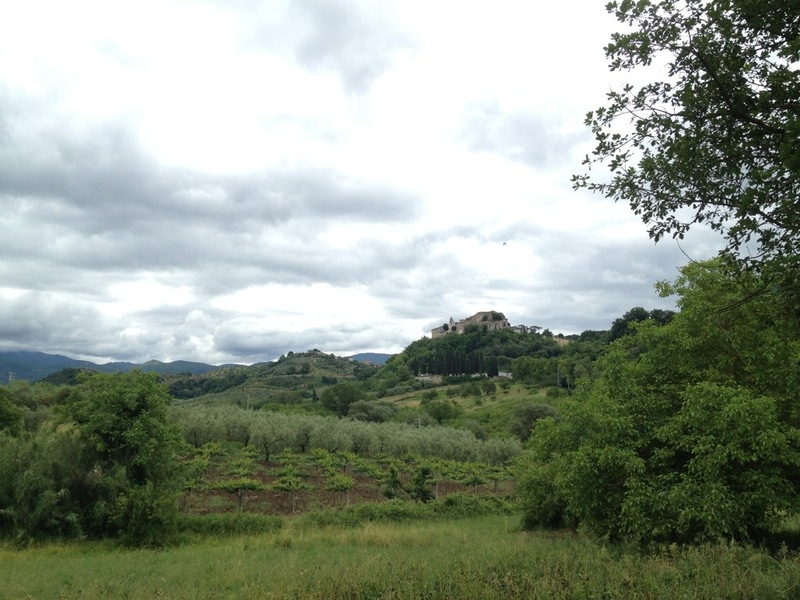 The thick forests of Umbria and northern Lazio have gradually given way first to olive orchards, then to vineyards and now to vast pastures, hay fields and grassy open areas. The mountains of the north are now rolling hills that are visibly opening up to wide plains. We’ve noticed also that weekend homes for urban dwellers are becoming more common and that the pace of life is quickening. Hill towns of Umbria would be quiet and empty on a Sunday afternoon, but these towns are a beehive of activity. In keeping with this change our quiet country road gradually turned into an urban arterial and we found ourselves navigating the narrow white stripe at the edge of the highway as Italian drivers speeded by. 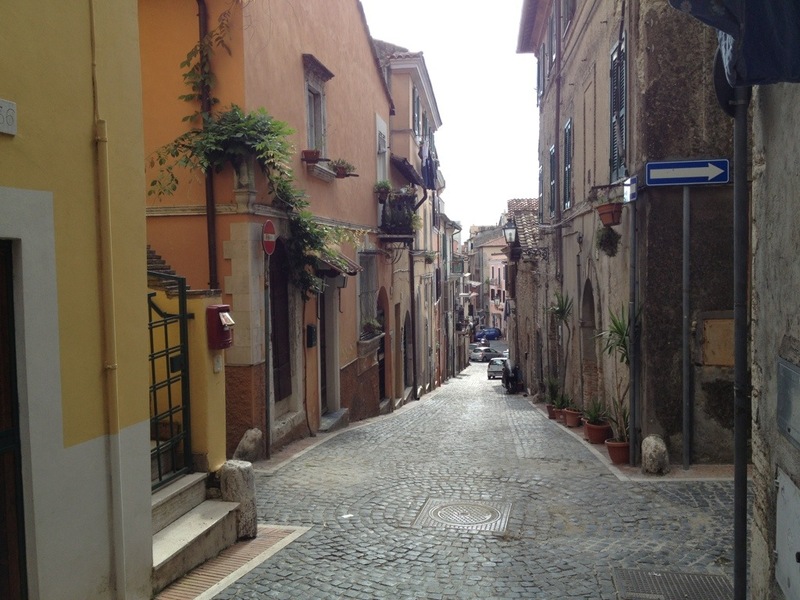 After an hour or so of this we crossed into Monterotondo, climbed to the upper city, asked directions to the lower upper piazza, and strategized about our hotel options while enjoying a gelato off the upper upper piazza. Before long we found ourselves in an inexpensive B&B just a few blocks from the cathedral. We enjoyed dinner at a takeout pizzeria, then settled in for the night. 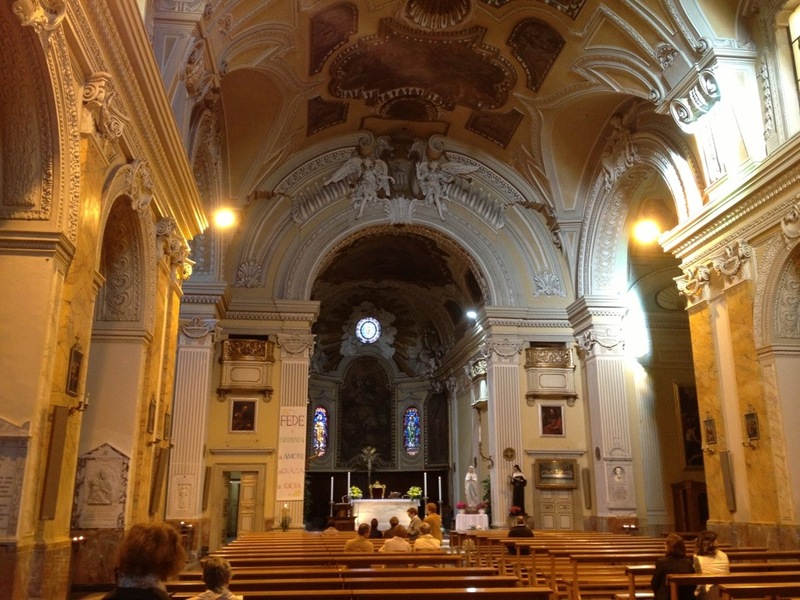 Tomorrow’s goal is Monte Sacro, just one day from St. Peter’s in Rome. 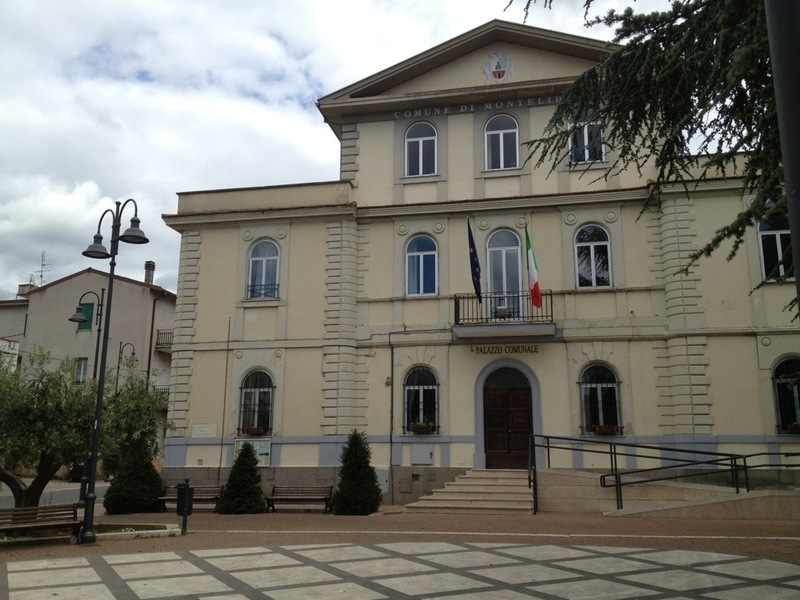 This entry was posted in Via San Francesco 2013 and tagged Acquaviva, Full Monte, Monte Sacro, Montelibretti, Monterotondo, Ponticelli, Rome, Span-talian, St. Peter's, Umbria by SandyBrown. Bookmark the permalink. Great to hear that you guys are almost there and doing so well!! I´m always happy to read about your trip! What was the rush to get to Rome early ?